AKIPRESS.COM - President of Kyrgyzstan Sooronbai Jeenbekov on April 12 discussed cooperation with European Union's High Representative for Foreign Affairs and Security Policy and Vice President of the European Commission Federica Mogherini, the Delegation of the European Union to Kyrgyzstan said. They discussed the good progress in the ongoing negotiations of a new Partnership and Cooperation Agreement, which will further strengthen bilateral relations between the European Union and the Kyrgyz Republic and expand cooperation to new areas. The High Representative and the President addressed political developments in the Kyrgyz Republic. They also discussed positive dynamics in the region, including the significant improvement in relations between the Central Asian States and increased regional cooperation. High Representative Mogherini had recently discussed these developments with the Foreign Ministers of the five Central Asian countries in the margins of the Tashkent Conference on Afghanistan. The Kyrgyz President informed the High Representative/Vice-President about his priorities for Kyrgyzstan's socio-economic development. 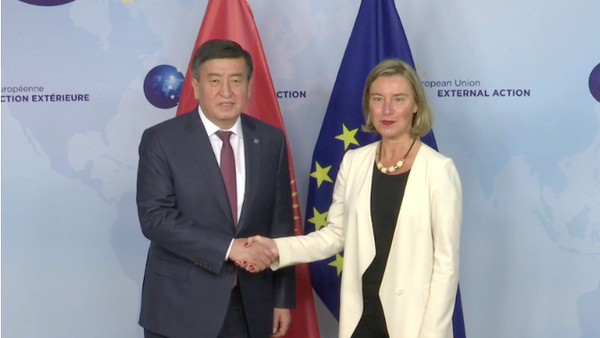 High Representative Mogherini reiterated the EU's commitment to support the continued consolidation of democracy, a professional and independent judiciary, and the rule of law, as well as sustainable economic growth in the Kyrgyz Republic. They both agreed on the importance of respect for democratic principles, and human rights and fundamental freedoms, including freedom of the media and political pluralism. President Jeenbekov will later today meet the President of the European Council, Donald Tusk, and the President of the European Commission, Jean-Claude Juncker, for further bilateral consultations. A new round of negotiations on a new Partnership and Cooperation Agreement will take place on 17 and 18 April in Brussels.